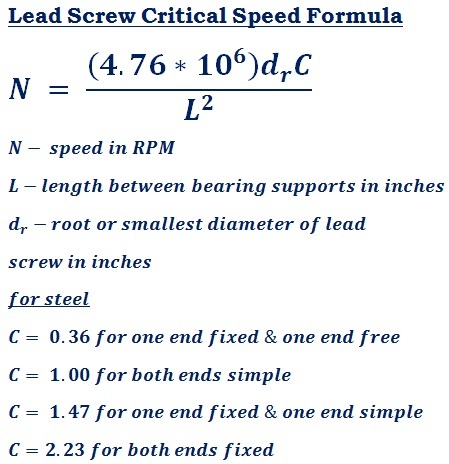 lead screw critical speed (N) calculator – step by step calculation, formula & solved example problem to find the angular velocity that excites the natural frequency of the power screw in mechanical power transmission. Length between bearing supports L in inches, root or smaller diameter dr & constant C are the key terms of this calculation. In field of mechanical engineering lead screws also know as power screws used to move large loads with minimum efforts, generate large forces & obtain precise axial movements in power transmission. The lead screw should be running under its critical speed, normally it can be rotate at the speed of less than or equals to 80% of its calculated critical speed. In mechanical engineering, the below mathematical formula is used to calculate the critical speed of the lead or power screw to transmit the mechanical power. The below step by step solved example problem may helpful for users to understand how the input values are being used in such calculations to find the angular velocity that excites the natural frequency of the lead screw in mechanical power transmission. Find the critical speed of the steel power or lead screw fixed on both sides having the length between the bearing support L = 60 cm & the smallest diameter = 10 cm. In the field of mechanical engineering, the term power screw in power transmission is a drive used in mechanical system or machinary to convert angular or rotary motion into linear motion. It has the speed limitation to prevent any mechanical damages due to power transmission. Therefore, finding the speed limitation (i.e) critical speed of a lead or power screw is become essential. The above formula, step by step calculation & solved example problem may be useful for users to understand how the values are being used in the formula to find the crtical speed of a leadscrew, however, when it comes to online for quick calculations, this calculator helps the user to perform & verify such calculations as quick as possible.